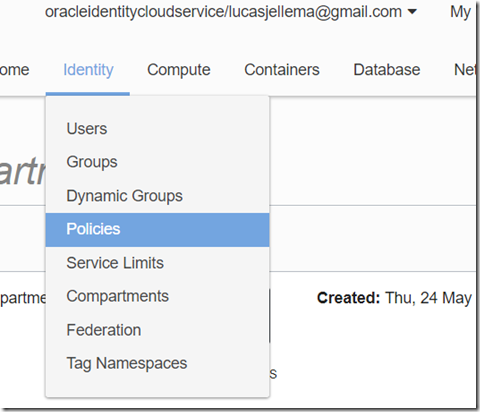 Within your tenancy, a suitably pre-configured compartment must already exist in each region in which you want to create and deploy clusters. The compartment must contain the necessary network resources already configured (VCN, subnets, internet gateway, route table, security lists). For example, to create a highly available cluster spanning three availability domains, the VCN must include three subnets in different availability domains for node pools, and two further subnets for load balancers. 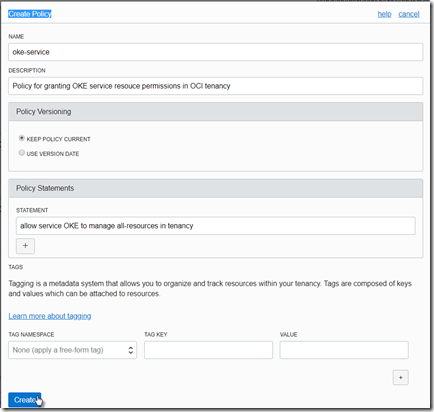 Within the root compartment of your tenancy, a policy statement (allow service OKE to manage all-resources in tenancy) must be defined to give Container Engine for Kubernetes access to resources in the tenancy. You have to define a policy to enable Container Engine for Kubernetes to perform operations on the compartment. Click on Create. The new policy is added to the list. Create a Virtual Cloud Network. The VCN must have a CIDR block defined that is large enough for at least five subnets, in order to support the number of hosts and load balancers a cluster will have. A /16 CIDR block would be large enough for almost all use cases (10.0.0.0/16 for example). The CIDR block you specify for the VCN must not overlap with the CIDR block you specify for pods and for the Kubernetes services (see CIDR Blocks and Container Engine for Kubernetes). The VCN must have an internet gateway defined. The VCN must have a route table defined that has a route rule specifying the internet gateway as the target for the destination CIDR block. Three subnets in which to deploy worker nodes. Each worker node subnet must be in a different availability domain. The worker node subnets must have different security lists to the load balancer subnets. Two subnets to host load balancers. Each load balancer subnet must be in a different availability domain. The load balancer subnets must have different security lists to the worker node subnets. Stateless ingress and egress rules that allow all traffic between the different worker node subnets. Stateless ingress and egress rules that allow all traffic between worker node subnets and load balancer subnets. 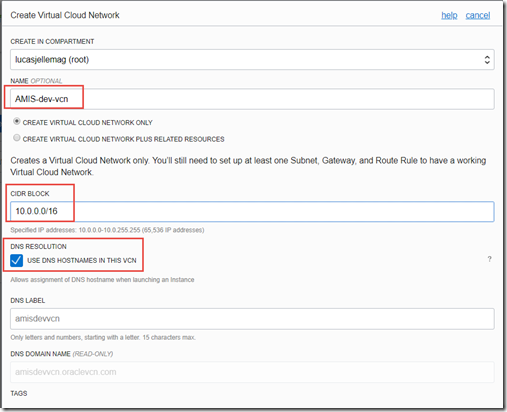 The VCN in which you want to create and deploy clusters must have a route table. The route table must have a route rule that specifies an internet gateway as the target for the destination CIDR block 0.0.0.0/0. 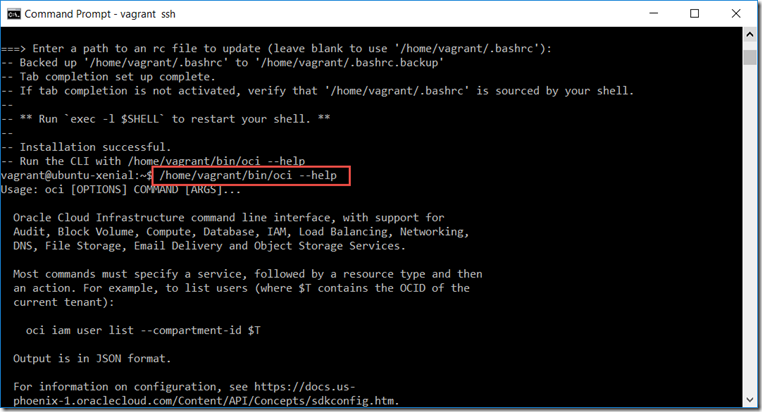 The VCN in which you want to create and deploy clusters must have DHCP Options configured. The default value for DNS Type of Internet and VCN Resolver is acceptable. 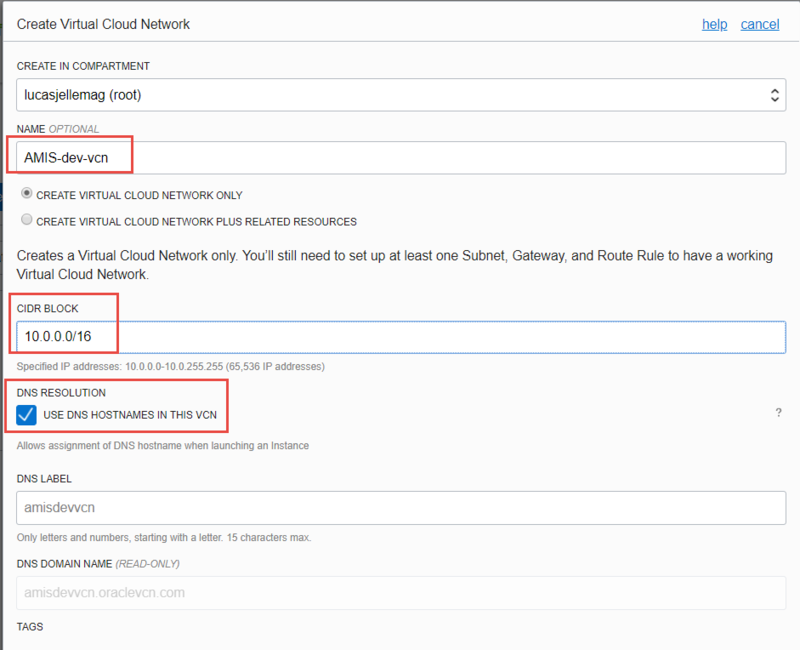 The VCN in which you want to create and deploy clusters must have security lists defined for the worker node subnets and the load balancer subnets. The security lists for the worker node subnets and the load balancer subnets must be different. (Three) subnets in which to deploy worker nodes. Each worker node subnet must be in a different availability domain. The worker node subnets must have different security lists to the load balancer subnets. (Two) subnets to host load balancers. Each load balancer subnet must be in a different availability domain. The load balancer subnets must have different security lists to the worker node subnets. Press the Create button. Now we have all subnets we need. Click on Home. Then click on Create Compute Instance. Set the attributes of the VM as shown in the two figures. I am sure other settings are fine too – but at least these work for me. Click on Create Instance. The VM will now be spun up. 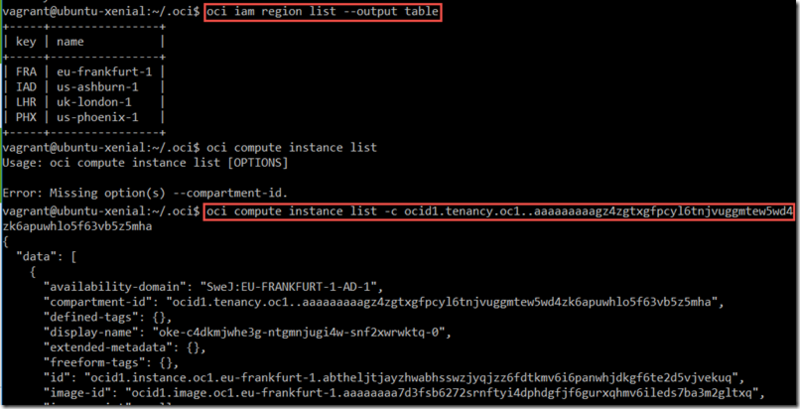 Note: initially I tried to just create the cluster as the initial user that was created when I initiated the OCI tenancy in my new trial account. However, the Create Cluster button was not enabled. Click on Create/Reset password. You will be presented with a generated password. Copy it to the clipboard or in some text file. You will not see it again. 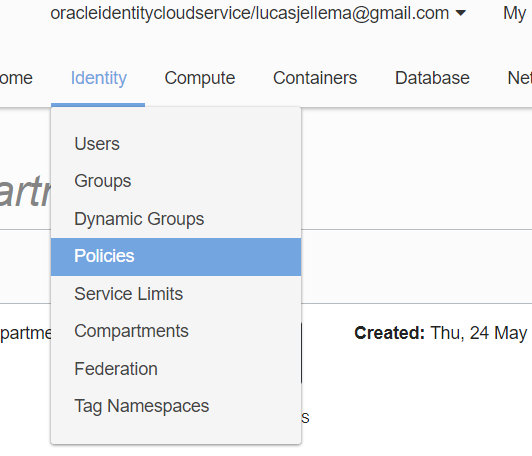 After preparing the OCI tenancy to make it comply with the prerequisites for creating the K8S cluster, we can now proceed and provsion the cluster. 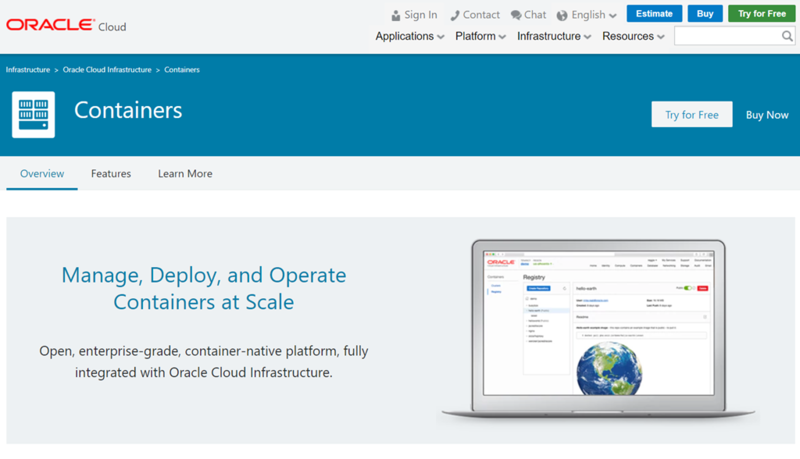 Click on Containers in the main menu, Select clusteras the sub menu option. Click on Create Cluster. Provide details for the Kubernetes cluster; see instructions here: https://docs.us-phoenix-1.oraclecloud.com/Content/ContEng/Tasks/contengcreatingclusterusingoke.htm . Set the name to k8s-1, select 1.9.7 as the version. Select the VCN that was created earlier on. 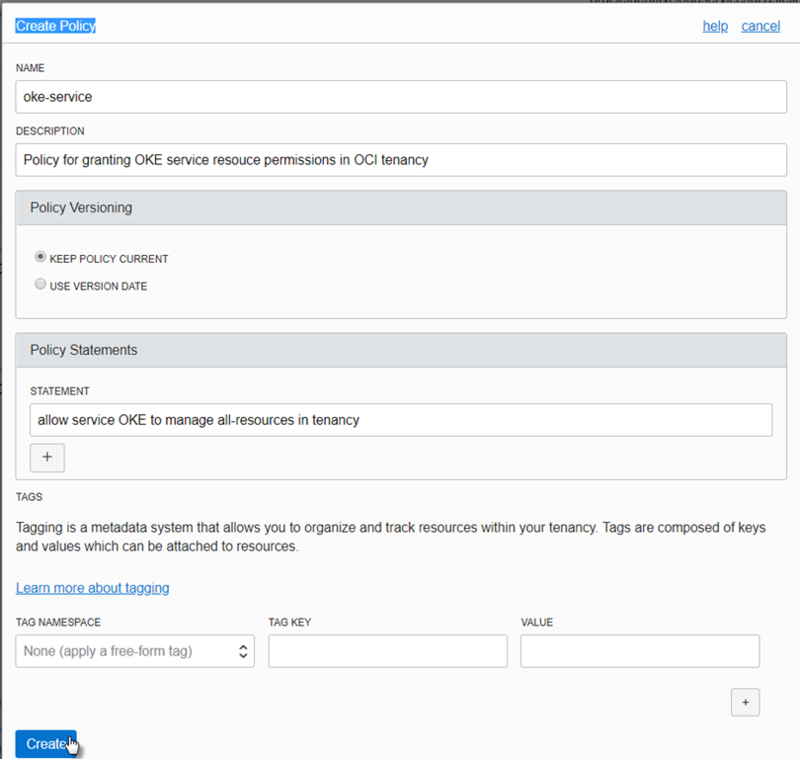 Select the two subnets that were defined for the load-balancers. Set the Kubernetes Service CIDR Block: for example to 10.96.0.0/16. Set the Pods CIDR Block: for example to 10.244.0.0/16. Click on Add Node Pool. Then press create to start the creation of the cluster. 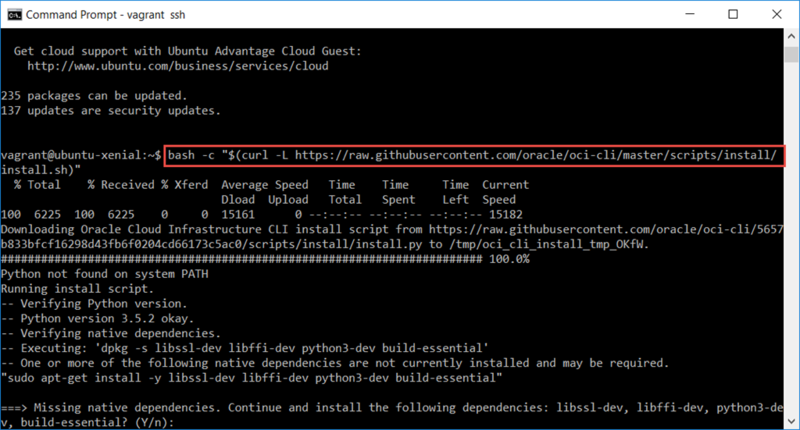 To interact with the Oracle Cloud Infrastructure, we can make use of the OCI Command Line Interface – a Python based tool. We need to use this tool to generate the kubeconfig file that we need to interact with the Kubernetes cluster. My laptop is a Windows machine. 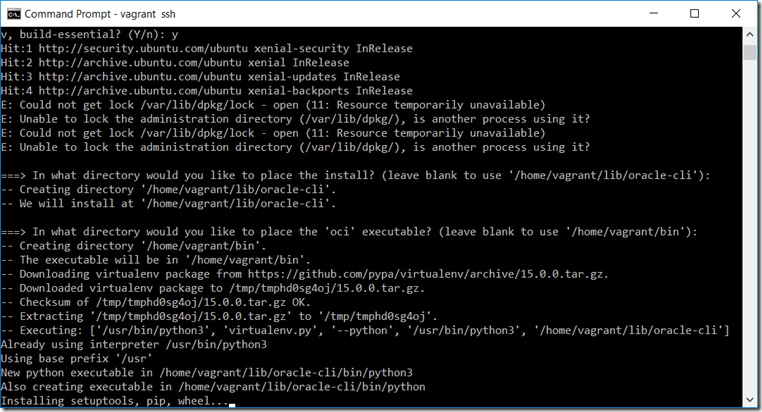 I have used vagrant to spin up a VM with Ubuntu Xenial (16.04 LTS), to have an isolated and Linux based environment to work with the OCI CLI. 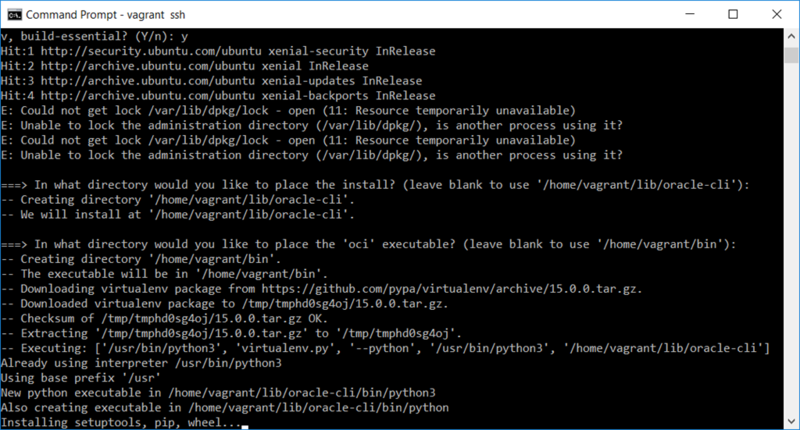 At this point, OCI CLI is installed and configured for the right OCI Tenancy. The public key is added to the user account. 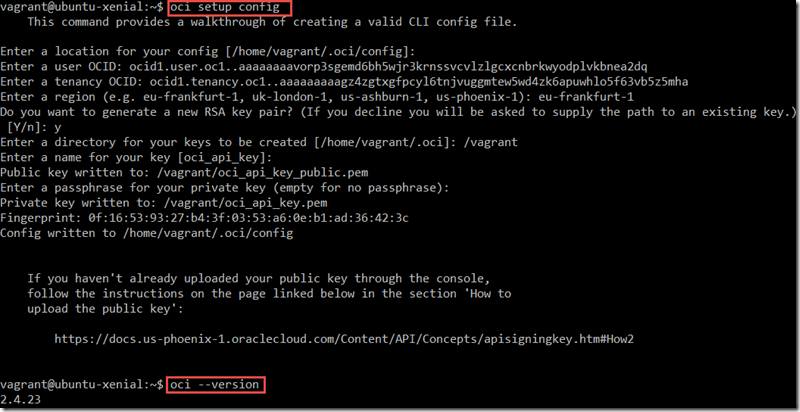 We should now be able to use OCI CLI to access the OCI Tenancy. 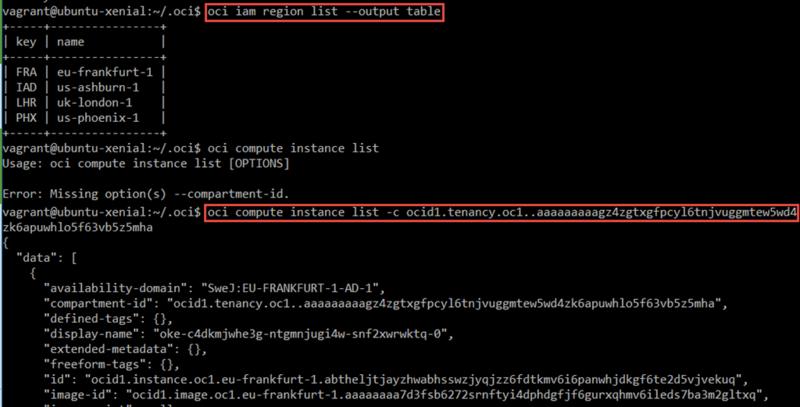 Note: the compartment identifier parameter takes the value of the Tenancy OCID. After installing and configuring the OCI CLI tool, we can continue to generate the kubeconfig file. The OCI Console contains the page with details on the k8s-1 cluster. 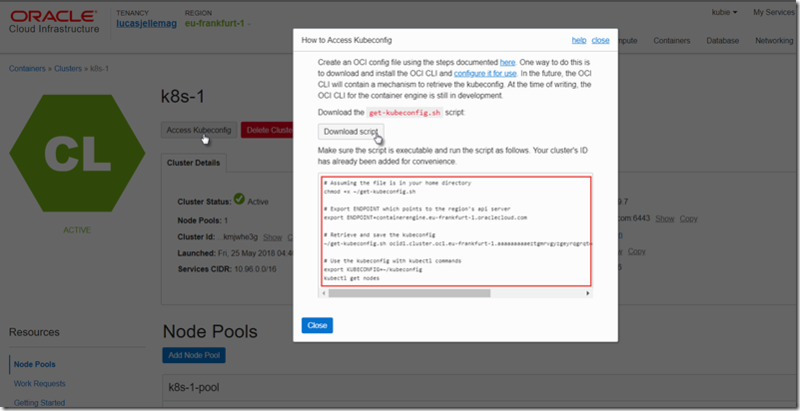 Press the Access Kubeconfig button. A popup opens, with the instructions to generate the kubeconfig file – unfortunately not yet to simply download the kubeconfig file. 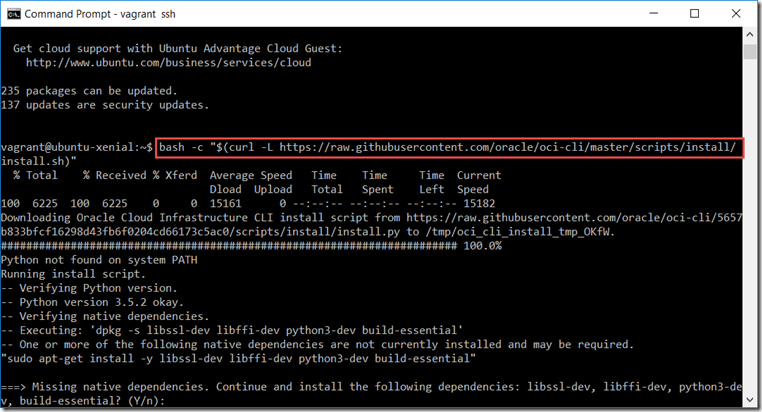 Download the get-kubeconfig.sh script to the Ubuntu VM. 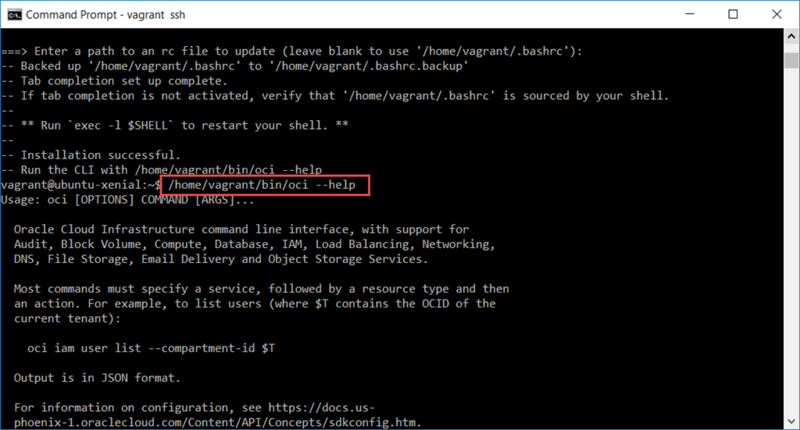 Make this script executable and execute using the instructions that are copied and pasted from the popup overhead. I am not sure what you are running into. At which IP address do you try to access the NGINX container? You could consider using a Service of type LoadBalancer or perhaps an IngressController? Note: I have been struggling a bit with access on the public IP address(es) and I have not quite figured out what is happening and why.